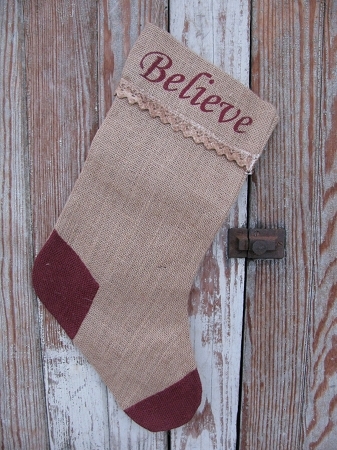 Primitive Believe Burlap and Lace stocking in burlap and red colors. Great size and design attractive. Jute hanger at top of stocking for hanging. Size is 16" x 7" x 9". The back side of the stocking is not decorated, plain burlap with the lace edge at cuff, so if you would like to display them that way it would work as well for another look. ONLY 4 LEFT!! !